It's not been an easy batch of semi-final matchups so far, but we are onto the third and last vote to pick who will join the other two finalists for the battle to become the 2010 Character Cup champion. 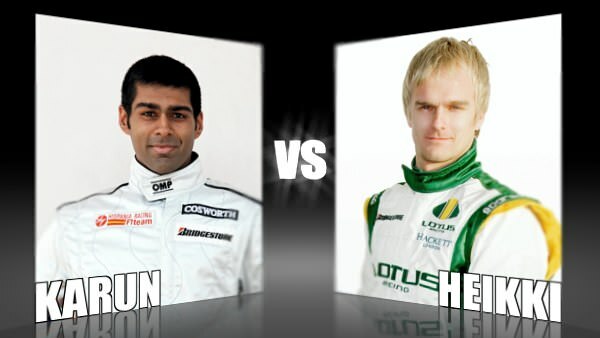 Today we see two very popular drivers from the new teams go head to head - Karun Chandhok and Heikki Kovalainen. Well, Chandhok has had a pretty easy ride of it so far. He saw off what can hardly be classed as competition from Trulli, who only just managed to make it into double figures. In the second round, he faced off Webber, who put up a stronger fight but the Australian couldn't stop Karun in his tracks. Will he manage to defeat Heikki in this round as well? Heikki had a really strong start to the competition, knocking out last year's runner up Sebastian Vettel. In round 2, he faced fellow "new team" driver Timo Glock, and today he is going up against the ever-popular Chandhok. Can Heikki see off the might of the Indian driver to get into the final?